A research study out of the State University of New York College of Environmental Science and Forestry (SUNY-ESF) is collaborating with Fahnstock State Park and Wonder Lake State Park in Putnam County to look at predator populations as part of an ongoing study of the declining population of New England cottontails (NEC), Sylvilagus transitionalis. NEC is a rabbit native to the northeastern U.S., but studies indicate that in the past decade, the population of NEC has decreased by as much as 50%. Some populations of the cottontails are in New York State Parks, and learning more about best management practices is critical to protecting this species. As the New England cottontail (NEC) is a declining species being considered for listing on the federal Endangered Species Act, there are a lot of ongoing efforts to create habitat for these rabbits in the Northeast. The hope is these efforts will preemptively restore populations of NEC in the region, making it unnecessary to list the species as endangered. The two greatest contributing factors to the decline of NECs are loss of habitat and the introduction of the Eastern cottontail, Sylvilagus floridanus. While the two cottontail species are almost identical in appearance, the Eastern Cottontail generally outcompetes NECs for food and habitat, edging the native species out of its former range. While loss of habitat and the introduction of the Eastern cottontail are both factors contributing to the decline of New England Cottontail, this study looks at predation in conjunction with other management practices. Predation accounts for almost all natural mortality in NECs. As such, increases or decreases in the predator community would have serious consequences for the cottontail population. Most management projects have focused on enhancing habitat for NECs, but this study considers whether those projects might have the unintended consequence of altering the predator communities in such a way that cottontail survival is reduced. If that’s the case, then it will be necessary to consider predator management strategies when managing habitat for NEC. 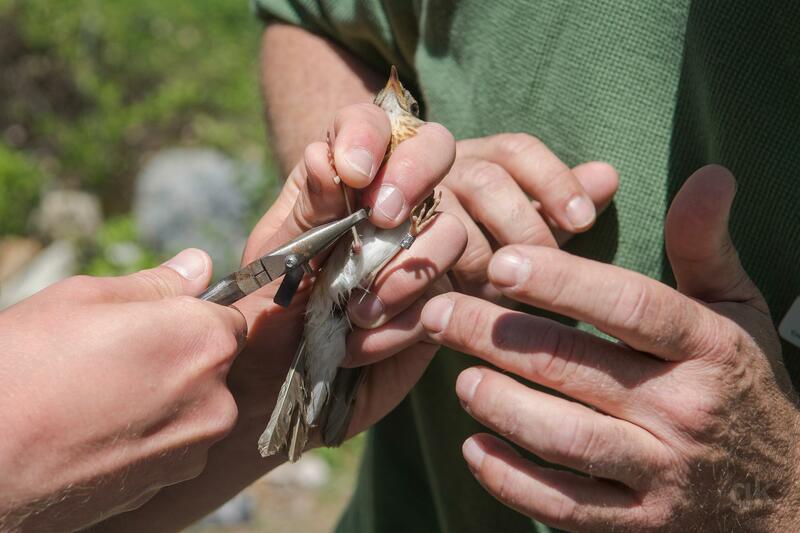 Results from this study will help inform habitat managers and recover NEC populations. The project, led by PhD student Amanda Cheeseman and Dr. Jonathan Cohen, both from SUNY-ESF, together with Scott Silver of the Wildlife Conservation Society and Putnam Highlands Audubon, uses trail cameras targeting mammal predators, in combination with visual and auditory surveys for hawks, owls, and eagles, to examine predator communities in areas where different ways of controlling and managing NEC habitat are already being practiced. The project is taking place across multiple sites in Putnam and Dutchess counties. The pictures above were taken in Fahnstock State ParkThe information from the predator study will be compared to data from radio-collared cottontails in order to get a complete picture of the predator-prey relationships in New England Cottontail habitats. No one likes to hop into the water on a hot day and find a slimy, tangled forest of plants. In many state parks, aquatic invasives plants encroach on public swimming areas, ruining recreational areas as well as habitat for native species in the same lakes and ponds. At Rudd Pond in Taconic State Park in Columbia County, a simple management strategy may prove to be an effective way to protect a swim area against unpleasant and unwelcome weeds. Eurasian watermilfoil and water chestnut grow densely along the shoreline of Rudd Pond. Rudd Pond, at the southern end of Taconic State Park, is a popular swimming and fishing area, supporting populations of panfish, largemouth bass, and chain pickerel. Unfortunately, the pond also supports thriving populations of aquatic invasive species including water chestnut, curly pondweed, and Eurasian watermilfoil. Benthic barriers are porous mats that are placed on the bottom of a lake or pond. They restrict sunlight from reaching the lake bottom in the areas where they are installed. 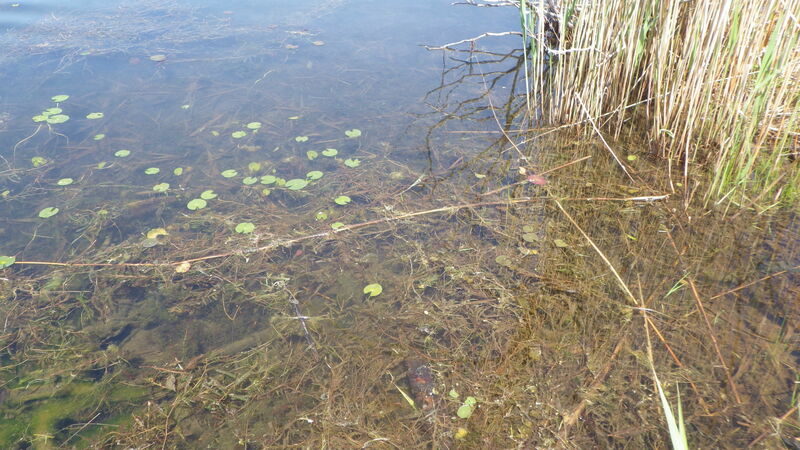 The absence of sunlight restricts the growth of aquatic plants. The benthic barrier mats were placed all around the swimming area. The benthic mats are used to create a buffer zone to prevent aquatic invasive species from threatening the utility of the public swimming area. An aquatic weed harvester is used to cut the plants below the surface in the main part of the pond. However, harvesters do leave behind fragments of plants that can regrow. There is no single perfect solution to managing aquatic invasives, but the use of several management strategies continues to show improvement at Rudd Pond. The mats were assembled on land, and then the water quality unit placed them in the water. Some park staff donned SCUBA suits to position the deeper mats! Featured image is of curly-leafed pondwater underwater adjacent to the Rudd Pond swimming area. Photos and post by Paris Harper. 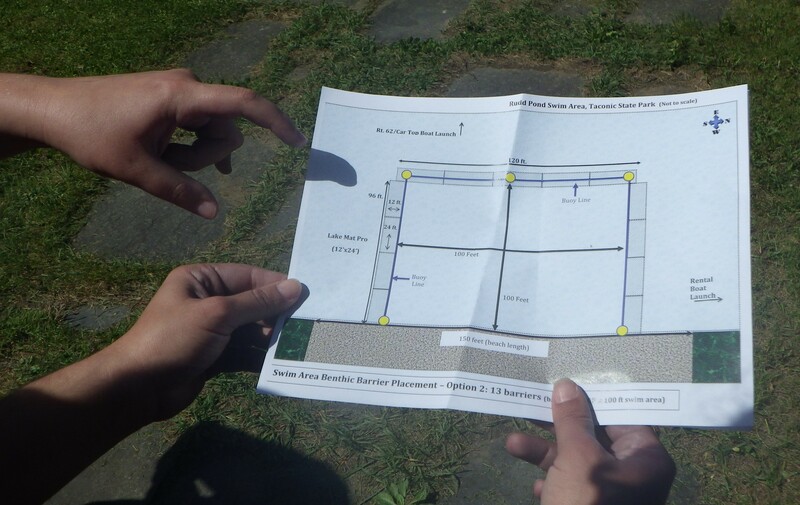 A project at Franklin Delano Roosevelt State Park aims to redesign the 6.2 acre parking lot in order to greater serve the goals of environmental sustainability and stewardship. The project will rehabilitate the lot’s surface, improve the efficiency of the parking layout and improve drainage and storm water runoff quality. The new parking lot will feature native trees and vegetation to visually soften the hard surface of the parking lot. Ultimately, the redesign will create a more welcoming and pleasant entrance experience to patrons visiting the popular pool and provide important benefits to the park’s wetland and lake by reducing the amount of nutrients (e.g. phosphorus) and typical parking lot pollutants that are currently flowing into these resources untreated. This is a joint project between NYS OPRHP and the NY Department of Transportation (DOT). DOT has been tasked with reducing phosphorus loading from storm water runoff from public highways and other impervious surfaces within the Croton watershed. They identified the large pool parking lot at FDR as a project that would help them meet their phosphorus reduction goals. As this lot is in need of rehabilitation, DOT’s assistance with its upgrade will result in a net benefit for both agencies. DOT will provide design and construction management funding and assistance. OPRHP will fund the construction contract. Parking lots can be bad for the environment for many reasons. More pavement means less green space, thereby reducing the number of trees and plants that serve as natural “air cleaners” by absorbing carbon dioxide in the air and releasing oxygen. It also means less open soil that can collect rainwater, which helps to replenish natural aquifers. Impervious surfaces, like asphalt, don’t allow rain to percolate into the ground; instead they channel rainwater to a storm drain. Stormwater runoff can be highly polluted with oil, grease, coolant, and other fluids which leak out of cars and collect on pavement until rain washes it into our lakes and streams, negatively impacting our health as well as the habitat and living conditions of fish and other aquatic life. Another negative effect of parking lots is that they raise local temperatures through a process known as the “heat island” effect. Asphalt and concrete absorb and retain heat from the sun’s rays more than the surrounding ground. This in turn raises surrounding temperatures a few degrees. FDR State Park is located along the Taconic State Parkway, approximately 40 miles north of New York City. The park offers day use recreational facilities including picnicking, trails, fishing and boating and areas for field games. One of the central features of the park is a large outdoor pool that can accommodate up to 3,500 bathers at a time. The park is popular with local residents for walking, hosts many events throughout the year and is also used for winter activities. To accommodate all these visitors, FDR State Park also has a very large parking area. The lot is 6.2 acres in size and primarily services the pool complex during the summer. It is also used year-round for access to nearby trails, picnic areas, and events. Storm water drainage from the existing lot is directed to storm drains that flow to a nearby wetland and then into Mohansic Lake, a large lake within the park. 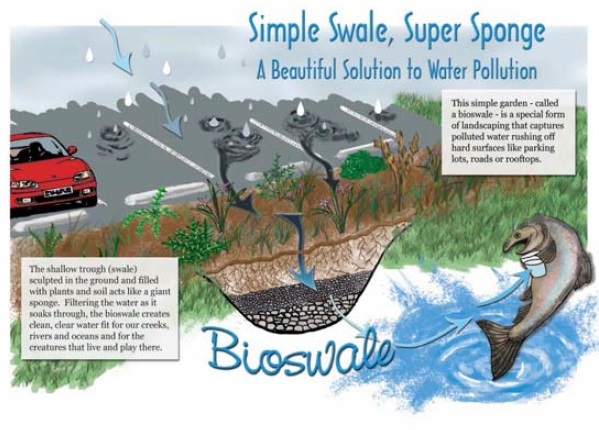 Bioswales are landscape elements designed to filter silt and pollution from surface runoff water. Parking Lot – The existing asphalt surface will be removed and replaced. The removed asphalt will be milled and reused or recycled. In addition, approximately 15,000 square feet of asphalt will be removed from an adjacent service road entrance and replaced with grass. Storm water treatment – The proposed plan includes the construction of new bioswales throughout the lot which will consist of a combination of soil, cobbles and native vegetation. Storm water drainage will flow into these areas before entering into the existing storm water drainage system. These bioswales will allow for biological filtration and treatment, breaking down many of the nutrients and pollutants found in typical storm water runoff. Native trees, shrubs, and ornamental grass species will be planted to reduce the lot’s heat island effect, improve aesthetics, and provide shade and wind breaks. 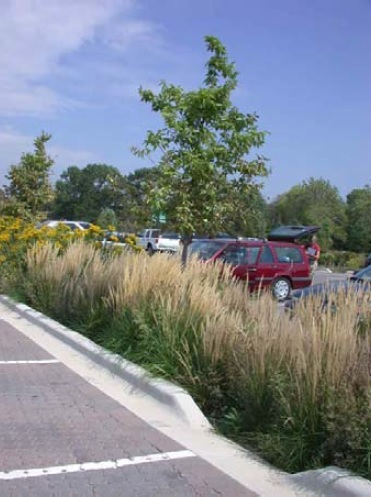 Below is a photo of a typical bioswale that is similar to what will be installed.